We have the ‘What’s New’ page that currently has some really great new stuff on it but we just got some more new stuff that I’ll be needing to update it with. I thought I’d update here first. The most timely would be the Dia De Los Gatos or Mercat Day of the Dead cards and prints Sissy Rose has brought in to celebrate the event. Her special Cat-Mermaids pose sweetly in Warhol style for a card to gift on the holiday or an homage to the alter or decor. These fun Mer-chicas will be hanging around afterward along with new Yuletide Cards and other humorous offerings. If you were wondering how you were going to add some unique zing to your Fall wardrobe, Leslie Pelotas has you back in a literal way. She has dropped off new, chic hoodie styles with wave patterns, Maxi Skirts, and even locally stitched clothing to brighten your Autumn days. 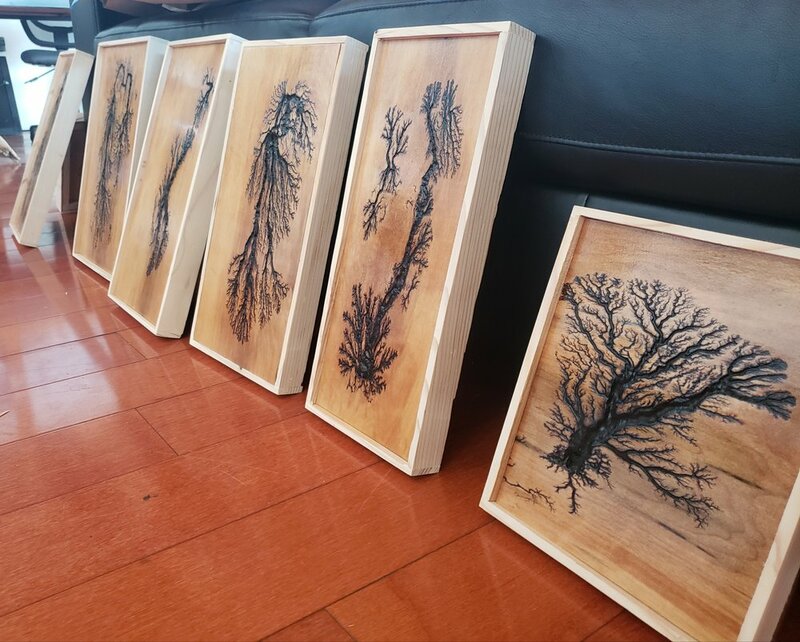 Electric Paintings in the House! Robert West graced us twice in the month of October with incredible works from his new artist’s studio. First he brought us Sculptures that you can see in ‘What’s New’ and then he brought a clutch of smaller format work for holiday shopping! Come down and see the new fractals before they fly away. When Karen Britt started back into creating jewelry inspired by the Oregon native stones, the first styles were ‘Embraces’. Karen wanted to set the stone without covering it in a unique way that put the stone’s natural beauty first. She has since pulled many other techniques out of the old jewelry bag of tricks for presenting stones and has circled back to the simplicity of the Embrace for some stone projects. New work will be landing daily in the Ozone during November for gift shopping and online Sales with shipping can happen for your out of state shopping needs. The Ozone is blessed with plenty return patrons and we thank you all. 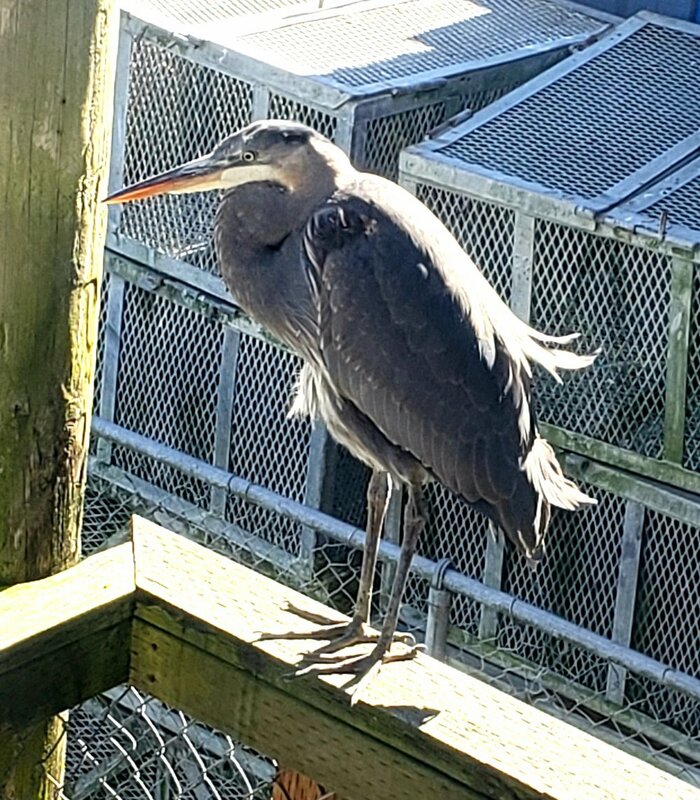 Duncan here, the Great Blue Heron, is a happy return shopper. We must have the most delicious Anchovies in the bay because Duncan has been hanging out daily for about 2 1/2 weeks now. Come see Duncan and the wonderful offerings in the gallery.